When starting a business, there are numerous decisions that must be made by the owners at the outset. 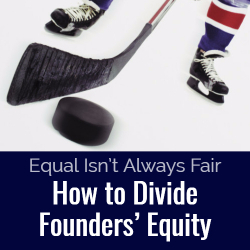 One rises above all others, however, and becomes the proverbial elephant in the room – how to divide the founders’ equity. The easiest answer, an even split among the founders, isn’t necessarily the best one, even if it sidesteps the founders’ emotions and egos. The primary shortcoming of this approach is that it fails to take into consideration the relative contributions being made by each individual. Ideally, the value of those contributions relative to the value of the enterprise would be the basis for determining how to apportion the equity. Unfortunately, in the context of a startup, valuation is far from an exact science. A startup, by its nature, has no history. There are no arm’s-length transactions to use as a means of calculating the business’ value, so assessing or even trying to predict that value is difficult. In addition, each founder likely brings something unique to the venture. Perhaps one of them had the original idea but has no business experience, while others have executive-level experience in the industry, or startup capital and an extensive business network. What impact will each of those contributions ultimately have on the success of the business? The challenge here is really twofold – the founders aren’t sure what they are giving up to each other in value, nor what the venture will get back from each in return. Believe it or not, when advising startup founders, the two best pieces of advice I give to help guide them through the process come from Albert Einstein and Wayne Gretzky. You may wonder whether a physicist/Nobel laureate and a hockey legend ever gave business advice, and the truth is, I’m not sure either of them ever did. But, taken together, their quotes encompass the guiding principles that should be used by founders when deciding how to divide their initial equity. Gretzky’s notion of looking forward is an important piece of the puzzle for business founders. In the context of a startup, founders often get caught up arguing about how they got to where they are today – who had the original idea, who was willing to contribute capital, who has relevant business experience from a prior position. While each of these considerations is relevant and may be important, it’s equally important for the group to consider what happens next, when the startup phase is complete and the doors are open for business. Although it’s important to consider what background, experience, education and skills a founder is bringing to the enterprise, it’s also important to look ahead and try to determine each founders’ potential impact and level of commitment to the business. The founders, like Gretzky, literally need to try to stay ahead of the game. A simple approach may involve quantifying the contribution in some tangible, material way. For example, some founders try to translate each of these categories to a dollar figure. The problem with that approach is that some of these categories don’t lend themselves as easily to being “measured” in this way. Certain things that are easily quantifiable, like capital, may ultimately be less valuable to the success of the business than a more conceptual contribution that is harder to label with a dollar figure, like industry know-how. In other words, what ultimately “counts” may be difficult to measure. Another mistake founders often make is trying to equate their respective contributions to an equivalent employee salary. Founders should avoid the temptation to simplify things in this way. The value of a founder’s work for a potential employer may only be a fraction of what some of these contributions may ultimately yield for the business, in part because salaries are determined by a variety of factors and may differ greatly among industries. In addition, the nature of business valuation is to take into account certain temporal factors and risk adjustments. Neither of these fundamental components of business valuation would be reflected in a determination based on a snapshot of an individual’s worth to the company, particularly at inception. There is no single, authoritative formula for arriving at the optimal equity split. The best and most tenable result will come from a process guided by principles that each founder believes to be relevant and fair. That isn’t to say that settling on the final split will be easy. However, coming to consensus early on the short- and long-term needs of the business and the founders’ respective contributions will minimize the potential for friction and, ultimately, disengagement. A thoughtful process has the greatest likelihood of yielding a result that is acceptable to all. Once the founders are all in agreement as to what it will take to make the company succeed, they should work backwards, looking at the categories of contributions and assigning a relative weight to each. This may be the hardest part of the process, as each founder may look to convince the others that the categories in which he/she will make the greatest contributions are the ones that should be most heavily weighted. The partners must work together to determine the relative importance of each category. Then, they can determine the equity split through a weighted calculation of their respective contributions. Taking this quasi-mathematical approach may serve to eliminate some of the more emotional, subjective arguments that each founder will undoubtedly use to plead his/her case. The founders should strive to be patient with each other, listening to each other’s concerns and asking questions to help narrow down the areas of potential disagreement. Such a process may feel a bit more cumbersome than simply splitting the equity evenly, but it will be time well-spent if the process meaningfully engages each founder. An equity split derived from shared principles is more likely to be accepted and respected by all. Founders should keep two other important concepts in mind when starting down this road. No matter how the initial equity is divided among the founders, all equity interests should be subject to a vesting schedule. This way, each founder will bear less risk upon an unexpected departure of an individual they deemed critical to the venture. The vesting schedule can be customized however the founders wish, based on any combination of time and/or performance-based conditions, but I always counsel my clients to place some restriction on the ability of a founder to walk away with a significant ownership interest in the startup stage. Also consider dilution when formulating the initial equity split. Many startups pursue equity financing from outside investors. Successful businesses may also use equity as a compensation tool to attract and retain talented executives. In these cases, the issuance of additional equity will dilute the initial founders’ equity. Founders usually give themselves pre-emptive rights in order to maintain their initial ownership share, but typically that anti-dilution protection requires an actual purchase of additional equity. The founders should create one or more models for a future capitalization table to account for these additional issuances and make an informed decision about splitting the initial equity. If market demand or a new phase of the company’s growth is what triggers the issuance of additional equity shares, a founder who has failed to consider that potential dilution may realize that he/she doesn’t have the opportunity to participate in the appreciation of the company’s value to the extent that was expected. While there isn’t necessarily a clear-cut formula to divide founders’ equity, the result should be derived from a process that feels right to the group. If they succeed with this initial agenda item, they will likely spend less time looking backward, second-guessing the decision that they collectively made, and more time focusing on moving the business forward and the bright future that potentially lies ahead.